Fade features Charlie Hunter, and Valcour features Aaron Parks. His music will probably appeal to fans of Ben Allison, the Bad Plus, people who like Brad Mehldau's "Largo", you get the idea. Fade is a bit more uptempo with odder schematics, whereas Valcour trends more toward introverted moments, but it's still a slim difference overall between the two albums. They're both really good. I'm addicted to both. Piano will always be my favorite jazz instrument, much as I will always have the greatest love in my heart for baseball, but I crave jazz vibes like I do NFL Sunday. There's something about the delicate explosiveness of good vibe work, it creates a velocity to the music no matter the tempo that, to my ears, is unlike any other instrument. And here's his artist site, which has five songs from each album to listen to. Also, three miscellaneous tracks he composed for his Hell Gate Strings ensemble are just about as pretty as anything you'll ever hear. 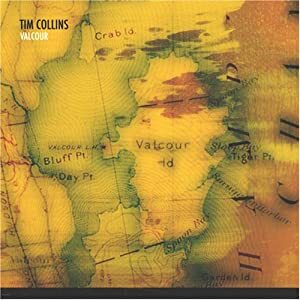 It's music like Tim's that keeps me subscribing to emusic. I just don't think I would've run into his stuff anywhere else. Jonah, I noticed your Tim Collins rec on the emu Jazz Rec Thread and listened to the samples of Fade. It sounds real good. I'll have to pick it up soon. If you squint, you can see a woman's face and shoulders in the lower half of the cover. Is that why they call you Bad Thoughts? Oops, never mind. You're talking above the shoulders. Tim has a new album coming out, no release date mentioned, just as "soon". It's called 'Castles and Hilltops' and features Danny Grissett, Matt Clohesy, and Tommy Crane. And, Tim, since I know reading this thread is part of your daily routine, let me remind you of your (yet unfulfilled) obligation to put together a HellGate Strings album and sell it to me. About the album/track: From my new album Castles and Hilltops, the piece 'Pond' features Danny Grissett (piano), Matt Clohesy (bass), and Tommy Crane (drums). Editor's comments: Some musicians possess the ability to pull a listener into the world of their album and turn the simple act of listening to a CD into an event rivaling the experience of a live show. Tim Collins is one of those musicians, and if "Pond" is any indication of the rest of Castles and Hilltops, then pick this album up and expect something special. A vibe player with a cinematic tone, he's backed by a solid crew of all-star names in jazz circles. Grissett sounds like he's been playing with Collins since childhood. Enjoy!